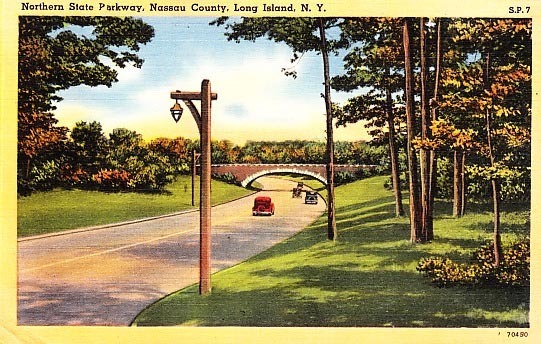 The Northern State Parkway as it appeared in the 1930s somewhere in Nassau County. Besides for a significant amount of additional traffic the parkway has not changed all that much in 80 years. "Besides for a significant amount of additional traffic the parkway has not changed all that much in 80 years." This photo raise a question that intrigues me- what was the route taken to Long Island prior to the construction of the horrible Long Island Expressway and the Triboro Bridge and Midtown Tunnel? Was 25A the preferred route? And how long did the journey take? Winter "Week-ending", in these houses that were close to Manhattan "as the crow flies" seems only to have become universally popular following the Second World War. I wonder if it had something to do with the time involved in the journey. Indeed it was both Jericho Turnpike and Northern Blvd. I can't remember the book...possibly Sobin's Dynamics of Community Change...that mentioned bumper to bumper traffic on Northern all the way from Queens through Oyster Bay. Bad enough that many who were making the trip would give up and simply pull their car to the side of the road and have a picnic. It got bad enough that caretakers of estates would have to chase people off their lawns. I think it very likely took 2-3 hours just to make it to Oyster Bay...if you made it at all. There was also Horace Harding Blvd to take into Nassau County which was mostly paved over when the LIE closely followed it's route. For all the wrongs of Robert Moses he did create a vast parkway system and made the beaches accessible to some, no buses from the inner city though thanks to the low bridge clearances, but he did lay the ground work for the suburbanization of LI, for better or worse. Sadly, some nice touches have not survived; the stone gas stations, the wooden lampposts, and most memorable for me a mysterious tower on the side of the bridge over Jericho Turnpike; I always wondered what it was meant for. I think that one stone filling station in the Huntington/Dix Hills area is still there but no longer in use. They were very attractive structures as well as the wooden lamp posts and railings. Moses knew how to build quality roadways. Some of what I was talking about is mentioned in The Power Broker, pages 151-155. Is this the highway where Santino "Sonny" Corleone in The Godfather movie (1972) was gunned down when stopping at the toll booth? Or was that cinema piece to have reflected a highway much closer to the city and on the southern shore? NSP is still a pleasure to ride today only comparable to Ocean Pkwy. Since I lived in Valley Stream for years, it was rumored that the infamous scene was filmed at the long torn-down Valley Stream toll booths, which were situated to the west of the current state police HQ. I still remember dad bitching and moaning about traveling east and having to pay a toll to go one exit -- until the made the tolls westbound only. I thought at one time Old Country Road was also used as a main route? I also love Northern, can't stand Southern, even more so when I pass the alley of trees that once led to the Belmont estate. Don't tell us he purchased the vacant station on Northern and is now living there with no running water or electric? Since Martin Carey has been kind enough to let EC take pictures of his houses for the express purpose of posting them on OLI, perhaps a decent interval should pass before everyone resumes the usual potshots from the peanut gallery.